Smartwatch or smartglass - which will you be wearing? Unless you've somehow created a technological void or have stumbled upon this site through some kind of mad clicking frenzy, you'll know it's been a fascinating few years for portable technology. There's an extremely high likelihood you could be reading this on a smartphone or tablet right now and as these all-in-one devices fulfill the gadget gaps in our day-to-day lives considerably well, you'd never have thought there would be a need to be any more personally connected than you already are. If the rumours are to be believed then almost every major technology brand out there thinks this clearly isn't the case. 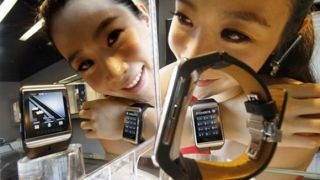 Samsung - which shipped more smartphones than anyone else in the UK last year - has already confirmed they're working on a smart watch. Of course, any modern-day rumour mill wouldn't be complete without a nod to Apple, which has filed a variety of patents that lend to the credence of a possible Apple iWatch arriving at some point later this year, if not sooner. Lesser-known brands have also taken the wearable market by storm such as Pebble with its smartwatch. Though not so independently intelligent as Google Glass or even Sony's smartwatch, Pebble was clearly seen by the 85,000 or so Kickstarter backers as something more plausible as an accessible entry in to the world of wearable tech. Without a tether to a compatible Android or iOS device, the Pebble on its own isn't actually particularly smart - its capabilities are reduced to telling the time in a variety of fashions. With Bluetooth connection to a smartphone though, the Pebble comes alive with a feed of notifications as well as returning intents to the smartphone of choice – such as control over music and many other possibilities - that no doubt developers will realise the full potential of once Pebble makes its way in to the hands of the masses, (many of the Kickstarter supporters are still waiting for their own to arrive). Google has already laid out its future wearables quite clearly with Google Glass. Though the project has split opinions on whether people actually want to wander around with a prop straight out of Star Trek on their face, the technology is incredibly alluring and enough to make us think we're truly living in the visions of the future laid out for us in films and TV sci-fi series for many decades. Google, however, is pretty much on its own when it comes to so-called smartglasses, other than the utterly uninspiring competitor product being touted by Vuzix. It's clear that even manufacturers are not sold on the idea that wearable tech could be so brazenly obvious and literally in your face. A large portion of the group that Google has chosen for its #IfIHadGlass 'competition' are mostly part of the elite, celebrities, high-profile technology journos and ultra-cool extreme sports types that will no doubt have been hand-picked for their circle of influence. Google is hoping that these folk can convince the average person that wearing $1,500 of advanced technology on their head is the way forward, but it's more likely that over the next couple of years it will just be considered the top-end in wearable possibilities and likely something that most people just aren't ready for. Can Apple hit back with the iWatch? A smartwatch, on the other hand (or wrist), costing a fraction of the current price-tag of Google Glass is much more appealing to the general public. They could have a trendy wrist adornment supplying them with all the important stuff they need to be aware of without causing the social faux-pas of getting out their smartphone at the most inopportune moment.